While Google Drive is no-way near the massive offering of free cloud storage like 10 TB from weiyun it does offer an excellent streamlined document editing, sharing and storage solution to Gmail users. Google has two great news for users, first they are giving away the popular Quickoffice mobile application to open and edit Microsoft® Office documents across your Apple iOS and Google Android devices for free and also topping up the offering with another perk by giving away an additional 10GB of free cloud storage space on your "Google Drive" account if you link the two by September 26, 2013. Cloud computing has made massive computing resources to be available instantly to users with a single command. The always available, on-demand computing infrastructure comes specially handy for developers as it allows them to create and destroy development instances easily. One of the major benefit of cloud computing is you only pay for what you use, so when you are not working on a cloud-computing instance it can be powered-down and no computing cost will be charged. 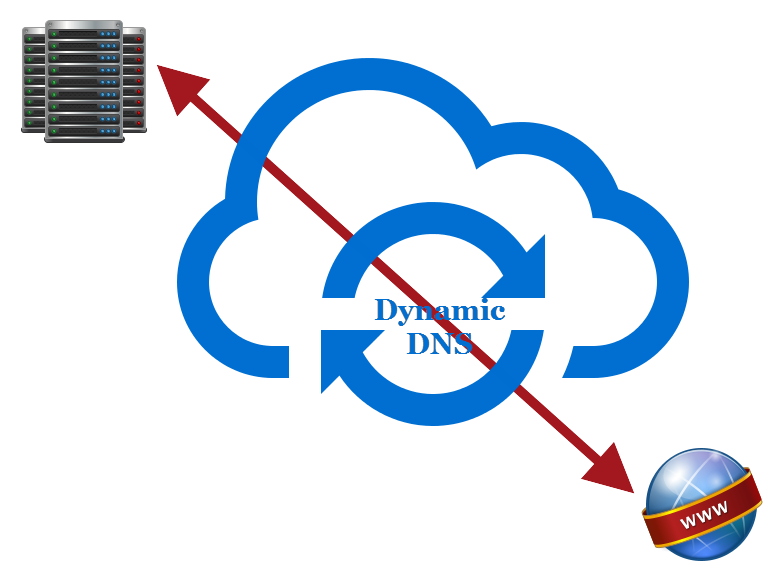 One drawback/annoyance of using this strategy is that the "publicly addressable" IP address will change with every reboot, to get past this we will show you how to use an automatically updated free dynamic dns system so you don't get bothered about the changing IP address anymore. 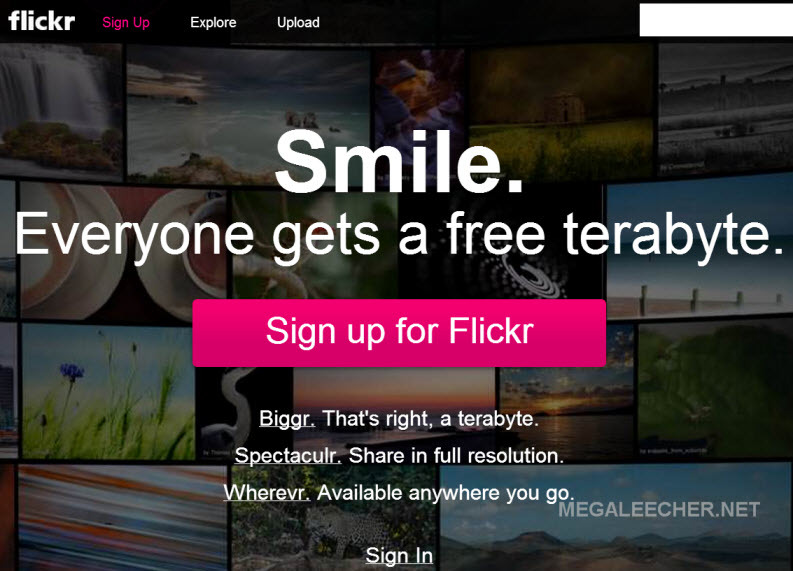 Recently flickr upgraded free image storage quota to a full Terabyte, but now Chinese tech company Tencent has played their card taking the game to a whole new level. 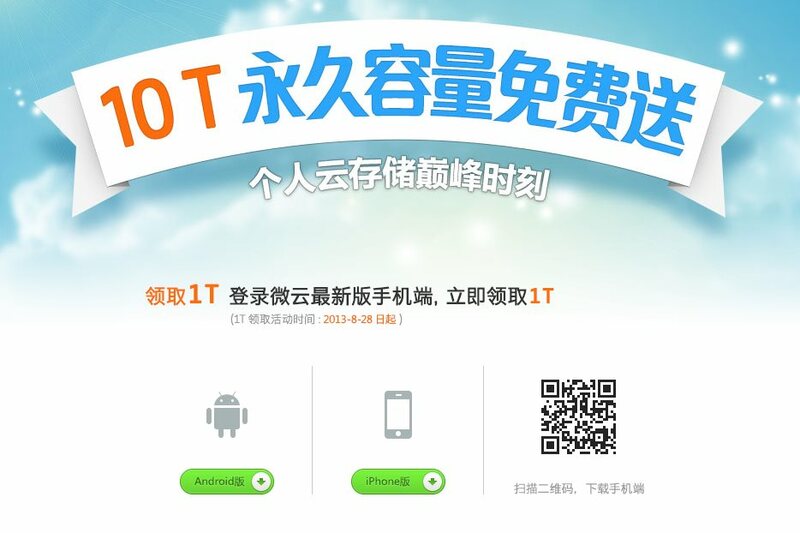 The company announced a shocking 10TB worth of free storage on their cloud storage service (Weiyun) for everyone, the best part is you get native mobile apps for Apple iOS and Google Android platforms to access the storage on your mobile devices. Fixing Amazon EC2 Connection Failure With Error "Caught exception reading instance data: http://169.254.169.254/2009-04-04/meta-data/security-groups"
Amazon offers some excellent cloud computing services, but being self-managed at the basic level it can be a headache to diagnose and fix errors. I recently encountered a similar error where all my attempts to login into the EC2 instance failed with cloud-init: runcmd Caught exception reading instance data: http://169.254.169.254/2009-04-04/meta-data/security-groups as shown in the Amazon EC2 instance console system log below. Read more about Fixing Amazon EC2 Connection Failure With Error "Caught exception reading instance data: http://169.254.169.254/2009-04-04/meta-data/security-groups"
Days after Google+ Photo annoucement, one of the oldest, leading photo-storage service flickr announced some big changes which will please it's users. The service will remain free as earlier and will now offer one terabyte of online storage under the zero payment plan, the interface has also been revamped and is now more attractive and easier to use. Users will also be able to share photos in their original quality at high-resolution. Another, welcome advancement is the introduction of native mobile apps for Apple iOS and Google Android which allows the "Upload once, send to any device, any screen, any friend, and any follower" scenario. 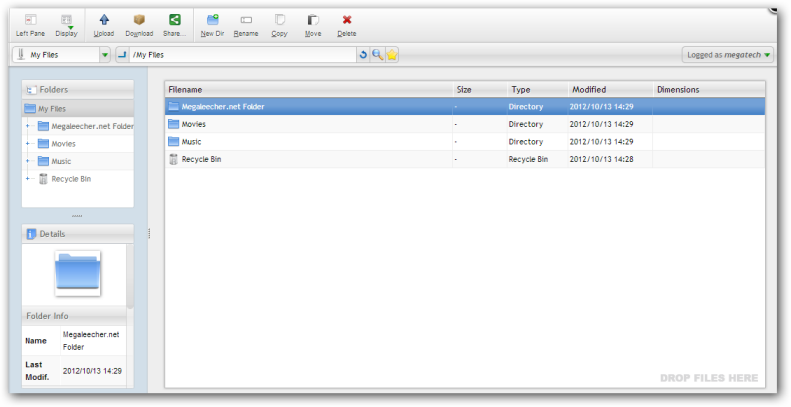 Cloud sync and backup niche is already crowded with big players like SugarSync, DropBox and SkyDrive. Adding another option to these offerings, popular remote desktop access service LogMeIn has came up with there very own cloud syncing solution - Cubby. One thing you will instantly notice about Cubby is that, it's an well designed and easy-to-use cloud backup and sync solution. The service allows users to share digital content across all their computers, tablets, smartphones or anything connected to internet via an web-browser. 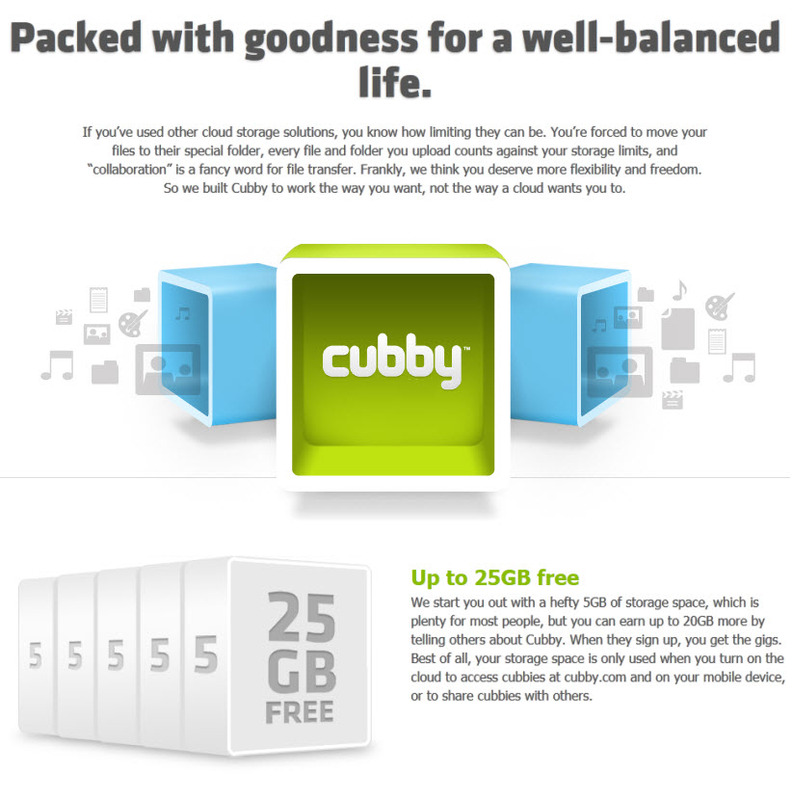 Apart from the usual 5GB free storage (with upto 25GB referral limit) and other cloud backup and sync functionality, Cubby features DirectSync allowing syncing across devices which does not count against users cloud storage, public and private sharing and the ability to sync-n-backup any folder of user choice. Online storage of your documents and media files not only provides a secure backup but also enables faster sharing and anywhere access. Almost all popular cloud services like SugarSync, DropBox, SkyDrive offer a free usage tier with paid upgrades for higher storage usage. However, a new cloud service provider BookMyCloud is offering Unlimited storage and bandwidth in the cloud with various advanced features like Multiple Repositories for Multiple Departments/Projects, unlimited virtual folders, unlimited password protected shared folders, publicly downloadable file-links with expiry, ability to view and edit documents online and support for custom domains and free sub-domains to access your online virtual disk. The interface is simple to use and streamlined with drag-n-drop support, view-n-edit support for documents, code and image files. Our mobile phones contain important data - be it our phone-book, pictures, videos or other documents. Things can get really messy in-case of a lost or non-working phone, and online mobile backup services are the answer to this problem. 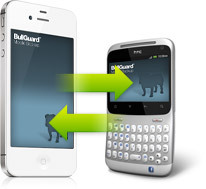 BullGuard Mobile Backup 12 is one such handy service, the utility is supported on all major mobile operating-systems - Apple iOS, Google Android and Nokia Symbian. The subscription based service offers seamless, encrypted, automated and hassle-free mobile data backup in the cloud with web-access. Best of all - it supports seamless data migration between two different devices. BullGuard Mobile Backup 12 is now available for free (2GB Plan) for 12 months under a limited quantity promotion, just follow the instructions and grab your own online mobile backup account for free. If we look at hardware specifications of today's smartphones they are more then capable to run an powerful desktop or laptop computer, so wouldn't it be a "smart idea" to use a single smartphone hardware all across your devices like tablet, laptop and desktop ? The idea of a single brain multi-utility computing device like RollTop is not new, but new startup NexPhone is not only modern, practical and innovative but it takes this to an all new level. By using a single brain (hardware to store and process your data) it not only makes things more affordable but also more manageable. Users will no longer be needed to buy different internet subscription plans and services for multiple devices, but also will have all there files, music , videos and software's at a single location without needing the cloud to synchronize in between. 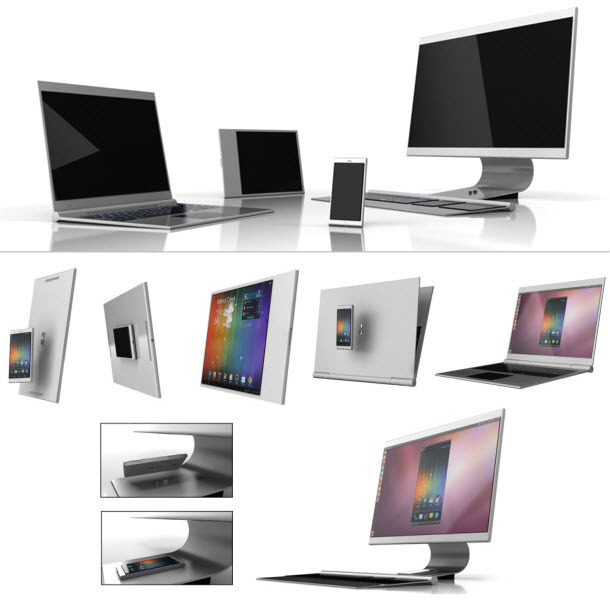 The idea is to have a NexPhone which would be an Android smartphone coupled with Ubuntu, which docks with connectors like tablet, notebook, laptop or desktop computer to provide the device functionality of your choice. The startup needs crowd-funding to get into production which seems sufficiently feasible, a nice introductory video and other related information after the jump. Amazon Glacier is the latest offering from world's largest cloud service provider, the service offers online data storage service at rock bottom pricing at just $0.01 gigabyte/month with no bandwidth charges for uploading data. The pay-as-you-go storage service is designed and suited for data which does not change much (cold storage) and is basically archival in nature - the service offers users with one of the best low-cost, secure, durable and flexible online storage solution currently available.